Credit for this incredible photo goes to Joe—He willingly allowed me to use this awesome photo he took from some of his travels. Go here to see more of his spectacular shots! One day the angels came to present themselves before the Lord, and Satan also came with them. The Lord said to Satan, “Where have you come from”? How many times have we felt like someone had cut a hole through or even knocked down our hedge…or “fence”. We all know what a fence is. We even know what they are used for. But for kicks….I looked it up. According to Mr. “Webster” A fence is a barrier enclosing or bordering a field, yard, etc., used to prevent entrance….or mark a boundary…..raise a fence…defend; protect; guard. Hmmmm, pretty clear what a fence is designed to do. We also know how we feel when it is damaged or missing, whether it is our property fence or….our heart fence. It is the “heart fence” that I am going to talk about. Once we discover the problem, we begin to search within us…sometimes the damaged or missing fence would be our own doing. For farmers a fence is of utmost importance. It not only keeps out the unwanted trespasser or animal, but it will also hold for safekeeping what you have on the inside. You don’t want your crops stomped. You don’t want your livestock injured or even stolen. And you especially don’t want them “wandering away”. Whether you have only 10 cattle or 10,000, keep the fence lines checked. If you have hundreds of head of cattle…and thousands of acres of land, this would have to be an ongoing task. Checking the fence lines would never end. Daily would you see to the security of your surroundings. The stability of the fence is a high priority. I looked at her in puzzlement, “oh, sorry no, I was talking to the Lord.” She kind of laughed and asked me if I did that often. I looked at her with all sincerity, “all day long”. I had realized less than two years prior to that new job that I could no longer go about my every day life, as if it were only my life. For through several life altering and heart sobering circumstances, I knew that if I were to continue on in the manner I had been, very lackadaisical in my Christian walk, then I would never be what my Father intended or wanted me to be. Looking back, I ask myself, did my fence get lowered and my circumstances change in order to “see what I was made of?”….or rather did my happy-go-lucky life of “hit and miss prayer time” cause the fence to fall into disrepair? Could be either. Could be both. At this point in my life, the answer is irrelevant. The result is significant. The outcome of each circumstance irrevocably changed me forever. If that is what it took to get my full attention on Him…then I would have to say it was worth every tear shed, every night spent on the floor in anguished prayer. I have to do a continual check on my fence line. I don’t want something coming in my life that the Lord does not invite in through the gate….and guess Who my gatekeeper is? Of course. Jesus Christ. I also realized over the years that some “tightening up” has been necessary. As a fence is neglected, it seems to lose it’s strength. the wires sag a bit. Erosion takes a toll on the fence posts, causing some to lean a bit. 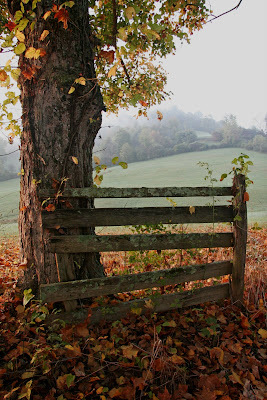 Time we spend in His Word pulls that wire of our fence tight, it restores the ground around each post. As we spend more time in His Word and in prayer on a daily basis, the fence posts seem to even cement themselves into the ground. But the fence line still must be checked daily. The enemy is more cunning with each passing day. He knows each of my weaknesses. He knows where the weakest place in my fence is found. I must continually ask the Holy Spirit to stand guard, apply reinforcement wire, “barbed wire” even to keep out the enemy! In knowing my weakness, I know what I have to do. For me, I have to spend less time in front of the TV, and more time in my Bible. The last thing I do at night is “quiet time with Him”. I have also had to spend less time “on the computer”. I rarely “shop” online. If I am on the computer, most likely I am reading blessings from other Christian Women bloggers, or I am working on my Laced with Grace post, or a new devotion to share with you, or praying for someone, or being blessed by the articles in the Christian Women Online Magazine (CWO) or working on the Youth Blog, Renewed Day by Day (sorry I have neglected that of late). I am trying to keep it under control. When I find myself spending too much time there…I simply stay away from it. Usually these days, I try and not turn it on at all on the weekends, unless I have a post that happens to fall on the weekend. I take a book and pencil with me everywhere though….for if the Lord gives me a thought for you—-which is always for me too….I am ready. I want to stand at the ready. Always willing to do what my Father requires. I keep my “work gloves” on….minding the fence. This is my 100th post. When I first began this journey, I never dreamed I’d be here. I had no idea where my first little blog would take me. The day I set my blog account up, I did not post anything. I had it in my mind what I wanted to post, but didn’t have time. I had discovered it during lunch one day, March 6th to be precise. On March 7th, the enemy came in….seemingly with every force he had. When my sister Wanda called the office I could not even speak to her for the thickness of the tears in my throat. She called me back in less than five minutes. She asked me if she could pray for me. I hesitated briefly, but told her yes, please do. I was worried that the phone that had been ringing (all 6 lines) non stop since I had arrived would interrupt. I was concerned that a co-worker, or worse yet, one of the attorneys would come to my office and need me. I was hoping that a client would not come early, as my desk is at the reception area. But when my sister began to pray with the authority of the Holy Spirit inside her, all worries and concerns melted away. Wanda had no clue what I was facing that day. She had no idea the phone call I had on my way to work, nor the frustration I was feeling from the hectic mornings routine. But the Holy Spirit knew. He spoke through her and demanded all “confusion to cease”. She prayed peace right into my heart and day. The phone didn’t ring, no one came in nor did anyone approach my office during the entire phone call. I stood amazed at what God had just done. What I think was that the enemy had a “gut feeling”, that through this blog business, I would be blessed. That my fence would be strengthened and that God would use me. I had no idea how God would use me, but I know that He has certainly used others that I have met in this realm of the Internet to bless my life, increase my faith and strengthen my walk with Him. If you have time, read my very first post. Especially the passage from one of my favorite authors that Wanda shared with me. Sisters, as we stay in with God, should the enemy break through and flood our lives —-rest assured, our Father will lift up a “new fence” against him! It has been my delight and privilege to meet each of you. Some of you have gotten to know me quite a bit. I love each of you and want you to know how you have blessed my life with your love for Jesus! Go in God this week….check those fence lines! This entry was posted on Monday, November 12th, 2007 at 12:30 am	and posted in Missions. You can follow any responses to this entry through the RSS 2.0 feed. My pastor also warns us about where to build that fence. That is don’t build it close to whatever it is that tempts you. Keep it well back so that you can’t see from your fence the things on the other side that could negatively influence you. This is my first visit to a “blog”. I like this site, sort of a daily journal that you share with others. I’m glad my photography can help “insoire” thoughts to you. Congrats on your 100th post! It was a beautiful reminder to check those fence lines! What a great 100th post! Angie – I loved your fence analogy. Living in the west as I do, checking the fence line is as ordinary as checking your oil. I have never thought of it in a spiritual way before. And I will never think of it the same again. Thanks again for your wisdom and insight.And congratulations on your 100th post. I am so grateful that God led you to this ministry. I cannot tell you how often He has used you to speak to my heart. You have been a dear blessing in my life.p.s. I read the book, Dinner with a Stranger and I also rented the movie from Netflix. It was really good! Sista, Thankfully He guards our heart! Loved the blog! You know being in the ministry I see people that want to call themselves “fence checkers” – always interested in other people’s fences and forget their gate is standing open. Lord, help me not be quick to point out others sagging fences and help others with theirs and pray for them because tomorrow it could be my fence that needs mending, too! Angie the Lord gives you such wonderful thoughts, Keep blogging girl!!!! I give you “100” on that blog- – “A+”! Congratulations on 100! May God continue to bless you as you bless your readers…The photo is wonderful. Congratulations on your 100th post – wonderful photo too and a great reminder.